Purpose: Use this document as a reference for viewing the delivered page Maintain Flags in ctcLink. The process Primary Job Flag Update (M-044) is run by Payroll administrators as part of the payroll process twice a month. It sets the Benefits Primary Flag to the job (Empl Record) being paid so Benefit deductions are taken on the correct payroll cycle. NOTE: While the process will move the flag indicator so that benefits will be deducted from the correct job, this flag will only be moved if the employee holds multiple jobs within the same Pay Group. 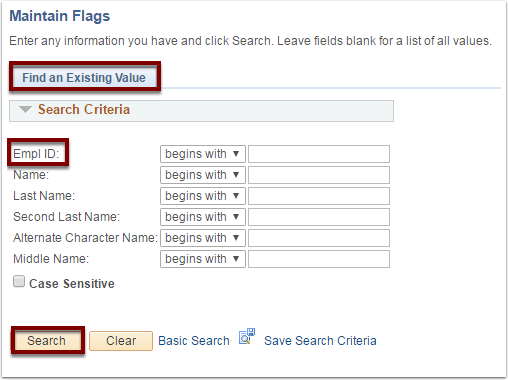 If the employee needs their Primary Job Flag moved to an EMPL Record that is associated with a different Pay Group than benefits were deducted from previously, it must be done manually through the Maintain Flags page. Create a run control if this is a first run of this process, otherwise click Search and the last run control will populate automatically. Use the lookup to select the Company for this run. Use the lookup to select the Pay Period End Date for this run. Use the Process Monitor to check to see if the process runs to Success/Posted. After the Payroll process has been run, if a change was made, it will be reflected in this view only page accessible by Benefits admins. NOTE: Due to the process that Payroll runs to set this flag, there is no manual entry needed in this area unless the Pay Group of the EMPL Record for benefits deductions needs to change in relation to the payroll period being processed. 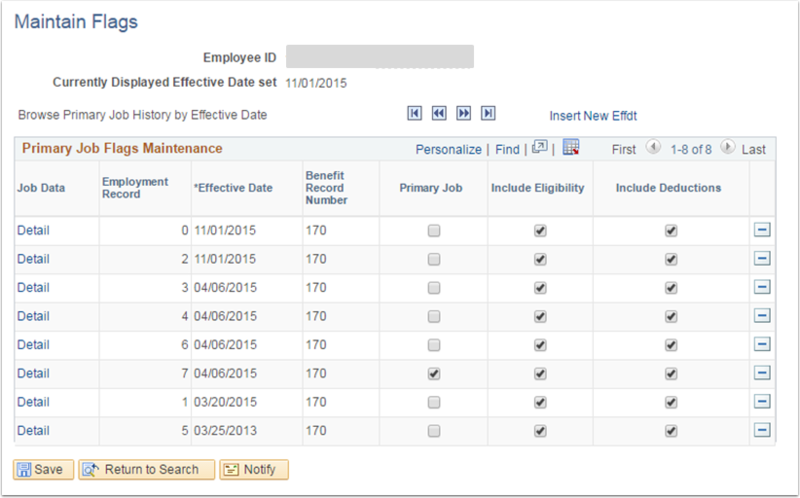 Use the arrows to navigate through changes in the record and the effective dates the changes are associated with based on if the process needed to assign a new primary indicator to be able to pay out benefits correctly during payroll processing. A new effective date is only inserted if there is a change, otherwise the process will not insert a row. 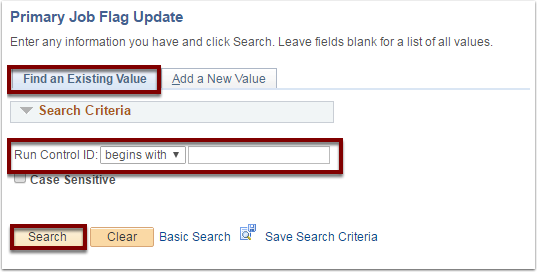 Job Data has a field called Job Indicator, and this field will tell you if a particular Empl Record is the Primary Job or one of any of possible additional Secondary Jobs. Commonly, these are referred to as “Primary Flag” and “Secondary Flag” however, the Job Indicator in Job Data has absolutely nothing to do with the Benefits Primary Job flags. In Job Data an employee can only have a single Primary Job through all jobs held in all colleges, so there will be one primary and many secondaries. The Benefits Primary Job flag, however, is unique to a school. NOTE: This means that every employee with active jobs at multiple colleges will have a Primary Job in every institution. In the above example, this employee works at both Spokane and Tacoma. In Tacoma they have two jobs. Both Tacoma and Spokane need one of their jobs marked as the Primary Job in respect to Benefits. It’s important to remember that there is a distinction between Benefits Primary Job Flag and Job Data Primary Job Indicator.